Songwriting on guitar is one of my personal favorites. So I’d like to give you some tips that will help you write your best material to date. The songwriting advice I share is largely based on accelerated development and creativity principles. 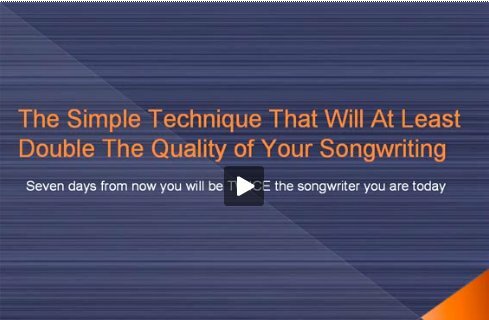 What I’m about to give you are tips that use these principles to rapidly improve your songwriting on the guitar. And it doesn’t matter what style or what type of guitar you play. These songwriting on guitar tips will work for all styles of guitar playing. I’ve shared these very tips with many guitarists who have been blown away at the results that followed… so let’s get into it! The best way to develop as a songwriter on the guitar is to discover how to tap into the vast reservoir that is your creativity. When you do this, you’ll find that your guitar riffs, licks, and progressions become far more unique, interesting, and compelling. A big problem is that it’s very easy to fall into the same patterns over and over on the guitar. Doing this builds habit, and when this happens you’ll find it hard to “break out” and create fresh, inspiring material. Well, let me give you a small procedure that will help you get out of this “rut” and BLAST you into new, exciting musical territory! Firstly, get your guitar ready to play. It’s important to work at your sound until it’s as good as possible. Play around until it’s sounding great. Work at the tuning… make sure the strings are fresh… have it at a comfortable volume, enough so you’re still “feeling it” as you play. At this point, setup a recording device so you can record the session. It doesn’t need to be highly sophisticated… just something that will capture your playing so you can listen to it later. Once you’ve done this, hit “record” on the recording device. Begin playing your guitar… Play the first thing that comes to mind. It doesn’t matter what it is. It doesn’t even need to be good. Play this for a while and then begin to follow your instincts as the idea takes you… Play everything that comes to mind. Experiment with each idea that hits you. Try to avoid common “patterns” and “routines” that you usually fall into. If you find yourself entering into one of your patterns, gently guide yourself away from this. Also, as you create freely… be sure not to “judge” any of your ideas. Continue to create… follow each idea that hits you… Enjoy creating completely freely and with no regard for what comes out of the session. You’ll actually find that when you create in this way, after a while “great ideas” will begin showing up in your playing. You’ll find yourself feeling very relaxed, and excellent ideas will begin to pour out of you. There are many reasons why this happens, one of which is this: As you create freely, without judging it makes it easier to get into what scientists call a “flow state”. In this state, you are more in touch with your inner creativity, and this makes it much easier to have wonderful ideas. After doing this “creative playing” for around 20-30 minutes, stop the recording. You’re most likely excited at some of the guitar ideas you’ve just generated. You’ll be eager to listen back to the recording. Ignore the urge though. What you need to do now is actually TAKE A BREAK for an hour or two. What this does is prepares your mind, bringing it into a "state of mind" PERFECT for listening to what you’ve created. After this short break, listen back to the recording, and take note of the ideas that are exciting to you. You’ll find many, I promise! Follow this songwriting on guitar procedure every day or two. You’ll not only find that each individual sessions brings new and exciting ideas… but as the sessions accumulate, the quality of your ideas will spiral upwards, getting better and better. The reason behind this songwriting on guitar technique is outlined in full detail in this article. The longer you keep up your daily songwriting on guitar sessions, the more unique and interested your guitar playing will get! Enjoy this exercise, and to discover how to take your songwriting to a world class level, you can check out The Songwriting Genius Within You course … which will take your songwriting to spectacular levels very quickly.